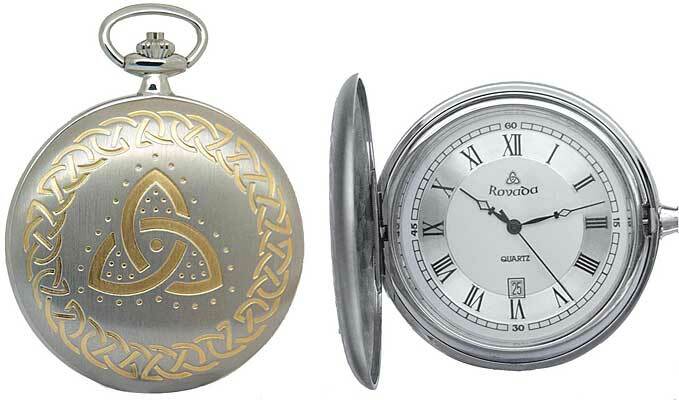 Silver& gold-plated hunter pocket watch, diameter 2 inches, Japanese quartz calendar movement, silver-plated albert. White dial with roman index. Three-year battery. Silver chain. Trinity knot and celtic interlacing design in gold on a silver-plated case. Delga - A Fir Bolg chieftain, builder of the Dun Delgan (Dundalk) fortress which was later to belong to Cuchulainn. The Fir Bolg were mythical early invaders of Ireland, between the Nemedians and the Tuatha Dé Danann. Known as the bagmen, they came from Greece where they were enslaved and made to carry the earth from the valleys to the bare hills. By using their bags as boats, they escaped and fetched up close to Boyle.